With over a decade of experience in the duct cleaning and inspection industry, the certified technicians at Alpha Air Corporation offer top quality HVAC system inspection services throughout the Minneapolis area. But while some duct inspection companies will just shine a flashlight in your ducts and give you an estimate, Alpha Air Corporation goes the extra mile for our customers. Using some of the latest camera technology, our technicians can inspect every inch of your ductwork using a small, robotic camera. This allows us to reach parts of your ductwork that normally would never be seen. We’ll even take pictures of it and show you before and after images so you know we’ve done a thorough job. Gives us full access to your ducts — We don’t think that a duct cleaning contractor should just go into a job "blind." That’s why we like to know exactly what we’re going to be dealing with every step of the way. The only way to do that is to be able to see every part of your ductwork. Gives you peace of mind — When we show you before and after pictures of your ductwork, there won’t be any doubt in your mind that you got your money’s worth. Over time, everything breaks down—that includes your ducts. But you wouldn’t know if or when that happens without actually sending a camera into the ductwork. With a robotic camera, we take the guess work out of everything. We can see exactly what is going on in your duct system. Two of the main problems that we encounter with ductwork are the development of holes or cracks, and the collapse of part of the ductwork. The latter is especially true with soft, insulated ductwork but can also happen at the joints of metal ducts. With camera duct inspection, we know exactly which parts of the duct system are corroded, broken or leaking. We can target our repair and cleaning efforts in those areas more specifically. 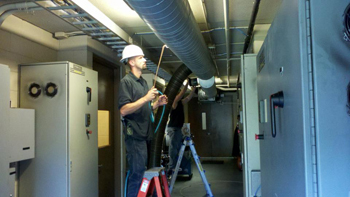 At Alpha Air Corporation, we get calls for duct repair from all over the Minneapolis area. Our camera inspection service lets us get up close and personal with all kinds of different ductwork problems. Here are some of the symptoms of faulty ductwork that we see. Low air flow — The ducts in your home are responsible for carrying air throughout your home. If there are holes or if part of the ductwork has collapsed, you will probably notice that the air flow to each room is diminished. Insufficient heating or cooling — You pay good money to keep your home comfortable. If you start to notice that your house isn’t as cool or as warm as you’d like it to be, one of the problems could be that all that conditioned air is leaking out through a hole or a collapsed duct. If you’re having any issues with the ductwork in your Minneapolis area home, call the certified experts at Alpha Air Corporation. We can send one of our friendly and knowledgeable technicians to your home to inspect your ductwork. Alpha Air Corporation provides quality air duct cleaning and HVAC system inspection services to the surrounding Minneapolis area. Give us a call today to speak with one of our specialists about an HVAC system inspection and schedule your next service appointment with us. 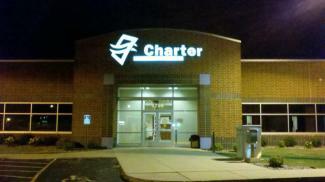 Alpha Air Corporation makes sure employees at Charter have clean air to breath by performing a thorough HVAC cleaning.